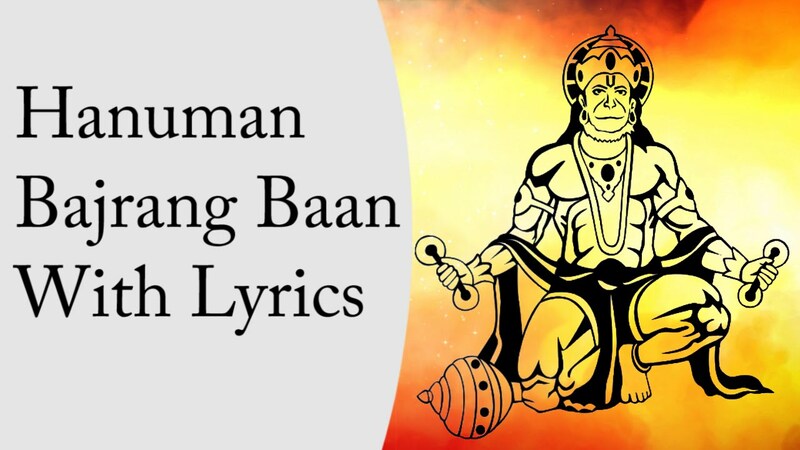 The Bajrang Baan is a Hindu devotional hymn (stotra) addressed to Hanuman. Hanuman is also known as Bajrang Bali. “Bajrang Bali”, “the strong one (bali), who had limbs (anga) as hard as a vajra (bajra)”; this name is widely used in rural North India. The Bajrang Baan is written by Shri Tulsidas in the Awadhi language. It is a very powerful mantra, when chanted with full devotion and complete good intention. For all devotees who are looking for the Hindi text version of Bajrang Baan please, download free PDF copy. 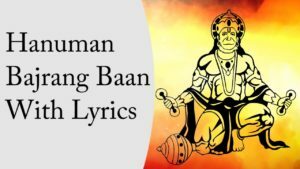 For all devotees who are looking for the English text version of Bajrang Bang Lyrics, please read below! Baadha sab har, karae sab kaam safal hanuman. Those devotees who recite these verses with love and unwavering faith have all their benign desires fulfilled by Hanuman. Hail to the refuge of the feet of Sita’s husband, Ramachandra. Glory to Hanuman, the benefactor of saints. Please listen to our prayer. Do not delay in doing the work of your devotees. Please rush to do it and give us immense peace. [Come running] in the same manner as you leapt across the ocean, entered and then emerged from the expanded mouth of Surasa [who tried to obstruct your path], and on landing in Lanka sent the demoness Lankini to the heavenly abode by kicking her to death [when she tried to prevent you from entering the city]. the ocean, symbolically breaking the knife of Yama, the God of Death. the sound of “Hail to Hanuman’s glory”. devotees, so have mercy on me. Glory to you who restored the life of Lakshman. [lust, anger, greed…] as if they were nailed by the strike of a thunderbolt. and crush them with your mace. Ram, rush to attack the enemy at once. mantras, penance, or the discipline of rituals and virtuous acts. Hail Hanuman ! The all-powerful son of Anjani and brave son of Shiva. thereby maintaining the sanctity and propriety of the holy name. sung by the gods], the mere remembrance of which dispels all sorrows. urge you with folded hands to swing into action[to protect me]. meaning an arrow as strong as a thunderbolt] ? always free from bodily torments of all kinds. Bajrang Baan and Hanuman Chalisa are both written by Tulsidas, there are meant for slightly different purpose. As mentioned earlier, Chalisa is meant to be chanted by everyone who want lord Hanuman’s blessing. On the other hand, Bajrang Baan is an advanced version with powerful beej mantras. This prayer Bajrang Baan simply signifies that the Arrow of Hanuman is a very powerful mantra to destroy negativity and fear. Those who chant Hanuman’s holy name with faith, devotion, and love and always remember him in their hearts are sure to have ali their desires fulfilled by Hanuman. Shri Bajrang Baan is solely written to ward off evil spirits, ghosts or black magic effects. Some theories also suggest that it has the capacity to reduce the malefic effects of planets (Grahas or Doshas). So, if a person is under the influence of negative energies or constantly seeing bad dreams or thoughts, then the best remedy is Bajrang Baan. It is one of most powerful mantra today due to which it is classified into both ‘Satwik’ & ‘Tantrik’ categories. It is important that the prayer should be recited with correct pronunciation and with a pure heart and good intention by devotees of Lord Hanuman. Ward off evil spirits and negative energies. Have positive vibrations in your body. Reduce the ill effects of Grahas. As Lord Hanuman is immortal and considered as a live form of positive energy today, this mantra is the best possible way to connect with him. Shri Hanuman Chalisa © 2019. All Rights Reserved.